Like a phoenix rising from the ashes Cullaun Sailing Clubs new dressing room and training classroom is rising up up from the ground and getting lots of attention. It has been a long time getting to this stage and without the help of the development committee and the overall committee we would not of even gotten to this stage. We have to thank all of our members who have made a contribution but also to the department of tourism, transport and sport who h ave helped us with sports capital funding, Leader for helping us to make up the short fall and to community Finance Ireland for helping us to secure funding for the outstanding amount that we need to make up. WindGuru is a tricky thing. Coming up to regatta weekends it consumes a lot of your time, checking and rechecking the app, hoping that Friday’s forecast will move to Saturday but that Sundays will stay where it is. Those of you who sail on Cullaun and use windguru will be only to aware that when they say it will be 10 gusting 18 it usually translates in 5 gusting 10, so when the forecast for the first day of the regatta says it will be 1 gusting 2, you have to be forgiven for hoping that they have just got it totally wrong. Friday evening saw the boats begin to arrive and Saturday morning saw the compound and the public slipway fill to capacity by 10.30. The OOD set a starboard course and the first race started at twelve. Two races were run in exceptionally light winds and blazing sunshine, but frustrating as this may be for some of us there are people out there who excel in these conditions and at the end of the day Brian Parks was showing the fleet that you should never write off an enterprise. There was talk of a third race but after twenty minutes without so much as a puff of wind, the days racing was abandoned. Some of us cooled down with a bottle of Cider in the car park as the wayfarers had their fleet AGM and then all retired to Gallaghers for the BBQ where an exceptional spread was provided. The weather intervened once again as the evening heat prompted the crowd back to Hayes’ house to sit, drink and chat in their back garden til the early hours. The next day delivered wind (not as much as was promised but enough to run some good tight races). Four races were run with the fleet close in all of them and the lead changing from race to race. It is always a good sign of the level of competition when the competitors themselves don’t know the outcome of the regatta until the prize giving. We experienced all kinds of weather over the weekend from blazing sunshine to torrential rain and from heavy gusts to flat calm, from beats that turned into reaches to runs that turned into beats, but that is the nature of sailing and the fun of racing. Congratulations to the prize winners (listed below) and thanks to all the competitors It’s difficult to remember all the people who need to be thanked for their contribution to last weekends regatta and although I attempted it at the prize giving, I am sure there were some omissions. My apologies to those I left out ( George for the excellent design work and Gallaghers for their hospitality throughout the year spring to mind) Regattas take a huge effort from a lot of people and the time, skills and energy given voluntarily are what makes an event a success. I must also mention the hospitality shown to our visitors which is as important to their continued support and enjoyment of the regatta as the racing itself. Many thanks to Mike and Maureen and Emmet and Samantha for this. Traveling to a regatta takes effort. It means derigging , packing trailers, spending the weekend away from home and then packing it all back up again at the end. It is however incredibly rewarding. You get to sail on different waters, with different sailors. You get to socialize in other clubs and build bonds and friendships that will stand to you over the years. You also develop as a sailor and you get to be a part of the broader sailing community on this island. Our thanks to those from East Down, Greystones, Lough Ramor, The national and Killaloe who attended the regatta. It would be great to see some more of our boats traveling to events and flying the flag for Cullaun S.C and continuing to develop links with other clubs,( the wayfarer worlds next year in greystones would be as good a place to start as any). Finally, I would like to thank East Down Yacht club for their generous (and unsolicited) donation to our building fund. A hugely appreciated show of support from one club to another. The 22nd Atlantic Games 2018 will take place next week in the Pays de la Loire,Saint Nazaire, France. There will be up to 500 competitors aged between 15 to 25 years from all over Europe competing during the week in a variety of Water sports. Paddy Donlon, Mike O'Dea, Luke O'Sullivan and Sean Hynes from Cullaun Sailing Club in East Clare have the honour of representing Clare and Ireland at these Games. They will be sailing in a J80 boat which is a 8 metre boat designed for racing and they will be competing against some serious competitive sailors from the other Eu countries over three days. Each of the sailors has already competed in national competitions in their own boat class but this will be their first time to all compete together in this class of a boat J80. 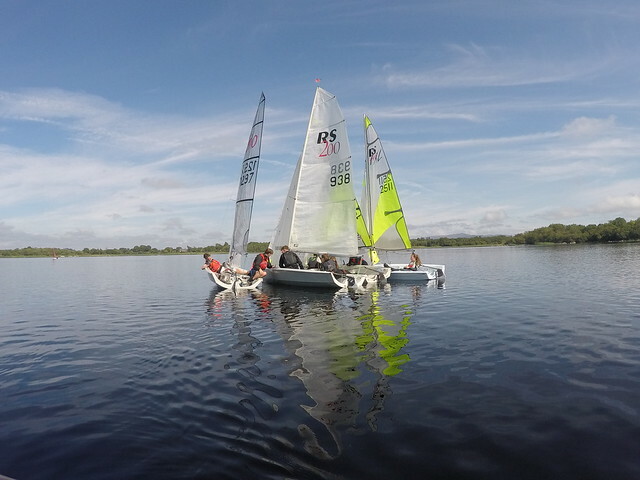 Simon Mc Gibney from Kilrush Marina has been very generous in loaning them a boat that they can practice on. Gail Mc Allister of the Irish Sailing Assocation and Cullaun Commodore Des Mac Mahon wish them the best of luck in this event and hopefully they can bring back some silverware as thier arrival back coincides with our Annual open regatta on the 1st and 2nd September as it would be a great boost to the club who are in the process of building a new clubhouse to compete with the new numbers of people who are interested in sailing as a pastime. This is not the first time that sailors from the Club have represented Ireland as Sean Hynes mother has won the national championship's and has sailed in Canada and Holland in the world championships.